In a beautiful deep blue metallic with tan leather and blue trim. 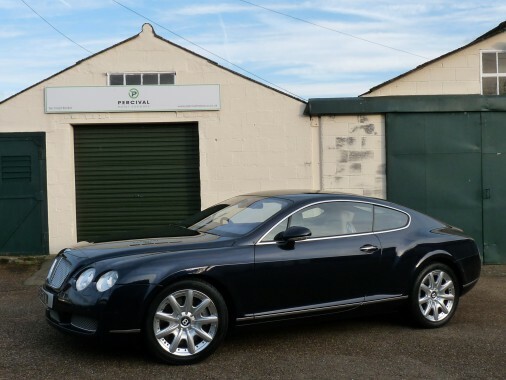 A lovely high specification GT Continental that has covered 77,000 miles with a full Bentley and Specialist service history. It had a full, ten yearly main service two weeks ago by a local Rolls Royce/Bentley specialist. The engine is a 6.0 litre, W12 unit and specification includes heated leather seats, massage seats, front and rear park sensors, xenon headlights, power fold heated mirrors, key-less entry and start, cruise control, 6 CD autochanger, satellite navigation, climate control, telephone equipment, 19in alloy wheels, electric seats with memory, a computer and front lower chrome grills. There have been four owners in total and the Bentley looks very handsome.